In 2014- October11, I published a post about the Coexist Movement. This spiritual compromising initiative is both very dangerous and is gaining ground throughout mainline denominations across America. There is another movement, for the most part less prevalent, but just as dangerous, and maybe the more, due to the subtleness of its doctrine, in light of the scripture. Along the spiritual spectrum it is 180° in the opposite direction of Coexist. It’s followers are often the product of institutionalized religion. Last summer I was out mowing my front yard when a small bus load of youth, accompanied by as many adults, unloaded at the end of the street and started to visit homes door to door in my neighborhood. As I was approached by one of the adult men in the group, I shut down the engine on my lawn trimmer and begun a cordial discussion with the visiting gentleman. He started of the conversation identifying the local church they were associated with and wanted to talk to me about Jesus. I shared my unadulterated conversion experience, whereby 30-year ago Christ had reached down and brought me out of a miry pit of sin I was immersed in and planted my feet firmly at the The Cross of Calvary, and for the past 20-years I had lay-pastored a small community church in our local town. For about 15-20 minutes we conversed in Christian circles and agreed in society’s need for Christ in this evil day. To some what of my surprise, the kind brother requested he leave a pamphlet with me to which I agreed. I must admit after sharing my testimony, I felt that the tract would be of better use if shared with a wayward neighbor down the street or in another neighborhood. I continued the grooming of my front yard, but made it a point of priority to keep the tract to read at a later time. Once I had cleaned up and retired for the evening, I got out my copy of the scripture and had remembered the tract that was handed out by the fine looking gentleman passing through the neighborhood earlier that day. As I read the tract it became pretty apparent to me, that the object they were promoting was not Jesus Christ, but their church or it’s denomination. Now I understood why the visitor felt the need to leave me the tract. 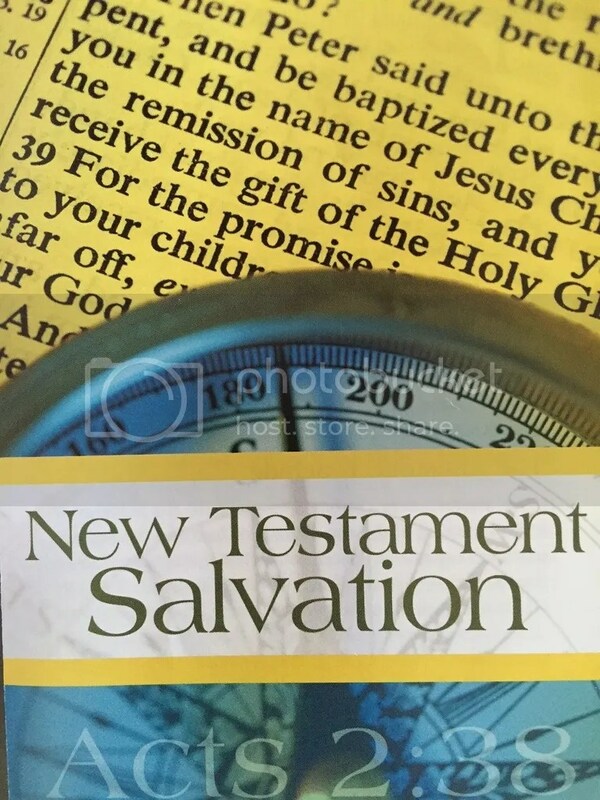 The fact that I was not co- joined with their denomination, I guess the redemptive work the Lord had done in me 30-year ago was something less than the “New Testament Salvation”. Now this is not all that uncommon. There are some churches that feel that their teaching (doctrine) is the only teaching that lines up with the bible. That their denominational religious rites seem to give them the spiritual skinny that places its adherents closer in fellowship with God than other ‘protestant denominations’. These particulars can be the cloths we wear of don’t wear. The music we listen to or don’t listen to, or what we eat or drink, or how we worship, how much we tithe, etc… In fact they have a regimented list of scripture that seemingly validates their pious biblical stance, thereby thwarting other denominational positions. Luk. 16:14 And the Pharisees also, who were covetous, heard all these things: and they derided him. We must guard our self against the same error that permeated the religious folk in the day of Jesus. They were guilty of propagating the do’s and don’ts of the scripture and the teaching of the same and overlooked the fact that they had transgressed the commandments of God by the tradition of their fathers. He that hath ears to hear, let him hear what the spirit sayeth! God is light, and in him is no darkness at all! The Christmas season conjures up the spiritual warfare that seems to be waxing stronger with each new year. The war is between light and darkness as the darkness vies for spiritual space that light used to possess. The world of darkness feigns that they just want equal opportunity to dwell in the same space with light. Now there is a spiritual principle that God has given evidence of in the physical realm. Light and darkness cannot dwell in the same space. Darkness is the absence of light. Even when a small amount of light is present, the darkness has to give place to the light. Herein lies a very important truth, darkness cannot suppress light, darkness only exist in the absence of light. Evidence of this spiritual struggle has just taken place in Tallahassee, FL. Last year the Satanic Temple of New York, petitioned for a permit to erect a display, giving place to Satan and his realm of darkness, next to the nativity scene at the Florida State Capitol, but the permit was rejected as “offensive”. While this is going on in Tallahassee, the Detroit chapter of the Satanic Temple, secured rights to place a display at the Michigan State Capitol in Lansing. Their display consisted of the snake from the Garden of Eden sitting in front of a pentagram, offering a book representing “knowledge” as a gift. “The center can’t deny use of the facility to any group based on their beliefs”. 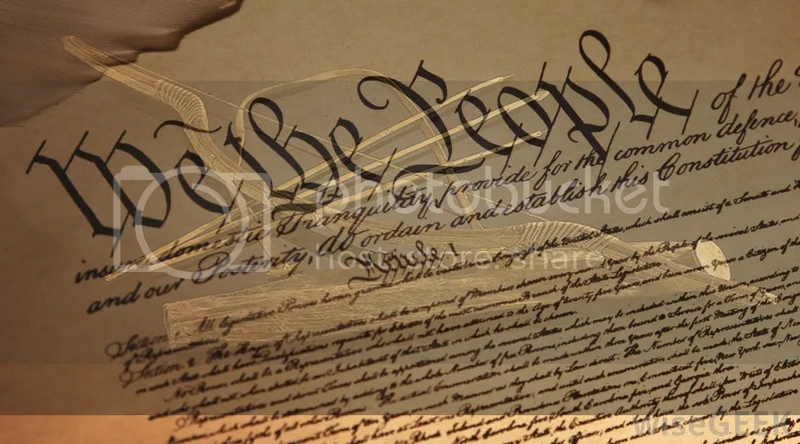 The weapon that is being wielded by the Dakhma of Angra Mainyu, the Satanic Temple, the ACLU and Americans United for the Separation of Church and State is the Constitution of the United States to espouse their satanic doctrine. Arrows winged with our own liberties and freedoms are seemingly keeping us from preventing such grievous wickedness from gaining a foothold in our society. It seems that the same principles of Helen Keller’s quote is well in play here. Deu 18:9 - When thou art come into the land which the LORD thy God giveth thee, thou shalt not learn to do after the abominations of those nations. Deu 18:11 - Or a charmer, or a consulter with familiar spirits, or a wizard, or a necromancer. Deu 18:12 – For all that do these things are an abomination unto the LORD: and because of these abominations the LORD thy God doth drive them out from before thee. Lev 20:26 - And ye shall be holy unto me: for I the LORD am holy, and have severed you from other people, that ye should be mine. Lev 20:27 - A man also or woman that hath a familiar spirit, or that is a wizard, shall surely be put to death: they shall stone them with stones: their blood shall be upon them. … the removal was necessary to inure the wickedness would not corrupt the entire nation. Consider the scripture reference from Isaiah on the kiosk in Tallahassee, understanding that Satan is known for twisting and bending the scriptures to promote his cause. The complete rendering of Isaiah: 14:12 includes something very important that was left off of the verse by the Satanic Temple. Isa 14:12- How art thou fallen from heaven, O Lucifer, son of the morning! how art thou cut down to the ground, which didst weaken the nations! A primitive root; to prostrate; by implication to overthrow, decay: – discomfit, waste away, weaken. … and America is giving place to him? Isa 5:19- That say, Let him make speed, and hasten his work, that we may see it: and let the counsel of the Holy One of Israel draw nigh and come, that we may know it! Isa 5:20- Woe unto them that call evil good, and good evil; that put darkness for light, and light for darkness; that put bitter for sweet, and sweet for bitter! … the next two versus speaks to their demise. Isa 5:24- Therefore as the fire devoureth the stubble, and the flame consumeth the chaff, so their root shall be as rottenness, and their blossom shall go up as dust: because they have cast away the law of the LORD of hosts, and despised the word of the Holy One of Israel. Isa 5:25- Therefore is the anger of the LORD kindled against his people, and he hath stretched forth his hand against them, and hath smitten them: and the hills did tremble, and their carcasses were torn in the midst of the streets. For all this his anger is not turned away, but his hand is stretched out still. As we see the spirit of darkness gaining preeminence, we can only surmise that God is removing His Light from our society. America will not find blessings in 2015. Pray God will have mercy on her. Chrislam is a religious movement that had its origin in Nigeria. Its agenda is a global attempt to commingle the teachings and practices of Christianity and Islam under one large religious umbrella. Spiritual sirens should be sounding at this point of the read. Muhammad and Moses were but mere man, but the Christian Faith teaches that Jesus was Yeshua ha Mashiach… God in the flesh! Islam and Judaism DO NOT believe the same.. 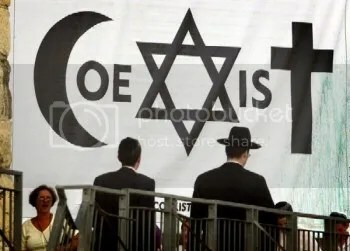 In an attempt to bring about Chrislam’s unification, the Coexist Foundation has filled the role that Satan is using to drive this spiritual awaking globally. To learn more about the Coexist Foundation click on the Coexist Foundation link in the paragraph below, but BEWARE! clicking on the link haphazardly could be dangerous to your spiritual health, even though you attend church with some regularity. For one to entertain thoughts of error, without having a sound teaching in God’s word, can leave one in a very vulnerable condition and found wanting. So with education as a focus, the Coexist Foundation has merged with the Yale Center of Faith & Culture to take the spiritual error to the collegiate level of the American society. This modus operandi has proven to be a very productive avenue for dispensing both error and moral decay to our society for decades, so no reason to change the tactic at this stage of the game. It is pretty apparent that Yale University is nothing less than the mouth piece for the Coexist Foundation. In Christ, God was reconciling the world to himself, not counting their trespasses against them. And he has committed to us the message of reconciliation. I find it somewhat perplexing that the COEXIST bumper-stickers are becoming more prevalent among the protestant churches all across America. Just reinforces the fact that there is a spiritual ignorance of the same. The organization’s to attempt to repair the divides caused by prejudice, hate and violence, by creating opportunity for people to work and learn together, in order to help build relationships, knowledge and common purpose to advance coexistence, is an admirable goal, but when the cause begins to dabble in the spiritual realm, it can only be likened to the mixing of oil and water. The two are diametrically opposed and not compatible at all. Even if you shake the two vigorously, it seems that the two substrates are comingled, but when the container is left stagnate, the blending will only return to its separated state. For it is impossible for “the two to become one”! So how should the church in America respond to such deception? We would do well to consider how Zerrubbabel, Jeshua and the rest of the chief of the father’s of Israel handled a similar situation, when the adversaries of Judah and Benjamin made an offer to help rebuild the temple after the captivity. In the book of Ezra, we find the account of Israel, post Babylonian captivity. Zerrubbabel took 49,897 of the congregation and returned to Jerusalem to rebuild the temple. The adversaries of Judah and Benjamin, feigned them selves as seekers of the same God as Abraham, Isaac and Jacob, but Zerrubbabel and Jeshua had no part of their deception. We would do well to learn from the same.. After all, oil and water do not mix very well, at least for any extended period of time. Gird up the loins of your minds lest you find yourself wallowing in this pool of deception. In a welcoming response to the letter, Mr Scalfari said the Pope’s comments were “further evidence of his ability and desire to overcome barriers in dialogue with all”. 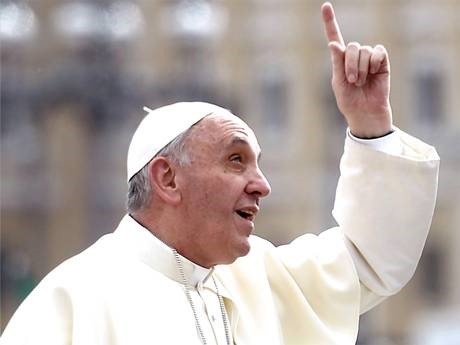 You can be a faithful participant in good standing with the Catholic Church without believing in the Pope? A wise man will hear, and will increase learning; and a man of understanding shall attain unto wise counsels. The fear of the Lord is the beginning of knowledge: but fools despise wisdom and instruction. So it is senseless to pay tuition to educate a fool who has no heart for wisdom. MOUNT VERNON, Wash. (AP) – “I kill for God. I listen to God,” a man accused of a northwest Washington shooting rampage said Friday at a hearing where six charges of first-degree murder and four of first-degree assault were filed against him. When we think of ‘killing in God’s name’, it is generally associated with the radical Islam front, where one finds no problem killing innocent people in the name of Allah, or some other religious extremismn it really doesn’t matter what banner they fly, but the comments (statement of defense) made by Isaac Zamora are not really all that uncommon at all. We have heard this seeming excuse on a number of occasions. On September 22, 2000, a 55-year-old man named Ronald E. Gay, angry for being teased about his last name, entered the Back Street Café in Roanoke, Virginia, a gathering place for lesbians and gays just a few miles from Lynchburg. Confident that God’s Word supported his tragic plan of action, Mr. Gay shouted, “I am a Christian soldier, working for my Lord.” Claiming that “Jesus does not want these people in his heaven,” he shot seven innocent gay and lesbian people. June 2004, FREEHOLD, N.J. ― A man who said God told him to kill and dismember his grandmother and his ex-girlfriend was convicted Tuesday of murder. Rosario “Russell” Miraglia had testified that he was carrying out an order from God by killing his grandmother, Julia Miraglia, 88, and his ex-girlfriend, Leigh Martinez, 31, the mother of his young son, in June 2004. Both women were decapitated and their hands and feet severed. November 2004, “Chet” Badowski Jr., 47, and Christine Badowski, 46, who were killed after returning from a mission trip to Haiti. Investigators found their dismembered bodies in a locked bedroom when they went to their home to check on them after they failed to show up for work. Philip Badowski, a college student who confessed to shooting his parents and then breaking a chain saw trying to cut up their bodies said, “God told me to” in a interview with police. November 2006 a Kitimat man charged with killing his teenage daughter. Sources have told CBC News that Blair Donnelly’s lawyer will argue his client is not criminally responsible of second-degree murder because of his mental state. In a statement of fact agreed to by the defense and the prosecution, the Terrace court heard that Blair Donnelly was under a lot of stress at the time, and believed God wished him to kill both his wife and daughter. The father was found praying outside a local church with blood on his hands. On June 20, 2001, Andrea Yates filled the tub with water and beginning with Paul, she systematically drowned the three youngest boys, then placed them on her bed and covered them. Mary was left floating in the tub. The last child alive was the first born, seven-year-old Noah. He asked his mother what was wrong with Mary, then turned and ran away. Andrea caught up with him and as he screamed, she dragged him and forced him into the tub next to Mary’s floating body. He fought desperately, coming up for air twice, but Andrea held him down until he was dead. Leaving Noah in the tub, she brought Mary to the bed and laid her in the arms of her brothers. Yates’ attorneys never disputed that she drowned 6-month-old Mary, 2-year-old Luke, 3-year-old Paul, 5-year-old John and 7-year-old Noah in their Houston-area home in June 2001. But they said she suffered from severe postpartum psychosis and, in a delusional state, believed Satan was inside her and was trying to save them from hell. What we need to understand, is that this calling is not of God, but the God impersonator. We learn from the scriptures that Satan is a god, the god of this world, and desires nothing less than to set his throne above the True and Living God. He is a liar, murder, and desires nothing less than to destroy life. Therefore Andrea Yates seems to have been the closest on identifying this culprit, it is the god of this world. When we see the killing of innocent people, no matter what the setting, rest assured the individual is doing the lust of their father, the devil. Satan was personified in the Garden of Eden as ‘the serpent’ and so when he convinces the individual to bring forth such death & destruction, it is evidence that he is stirring the ‘snakes in ones head’. Last year, the U.S. Centers for Disease Control and Prevention reported an 18 percent increase in suicide rates for Americans under age 19 in 2004, reversing more than a decade of declines. Thoughts of suicide? Stop thinking! When God gave this instruction to His people, the killing spoke of the unjust killing of the innocent. When we consider the commandment we probably perceive it in the terms of another, but consider the other, the one doing the killing taking his/her own life. It is against the word of God my friend, and it ought not to be. One can find a multitude of reasons as to the justification. You may think that you physical conditional is terminal or that you are undergoing some gross unbearable persecution. We even find this same thought process in the word of God, when men of God (Moses, Elijah, Job, Apostle Paul, etc…)were so distressed and so oppressed that they wished that they might die. But we find two very important things. 1. )They did not commit suicide. 2. )That God delivered them from those demonic thoughts. Now we are getting to the root of the problem. Satan is not only a liar, and a thief, but he is also a murder, a killer, and desires nothing but to destroy. He thrives on death, and more importantly the death of the soul that knoweth not the Lord. One must not allow Satan to deceive concerning this sovereign right of God. Time and time again we see evidence of God as the Author of life. Women and wombs that were barren and dead are quickened to bring forth life. But not only do we see the sovereignty of God in life, He reserves the right to control ones days. Let us consider what Job said to God…. “Man’s days are determined; you O God have decreed the number of his months and have set limits he cannot exceed”. So when man takes this action into his own hand he in essence is taking a responsibility that God has reserved unto Himself. Please consider that this is exactally what Satan wants the unstable soul to do…. “for God doeth know that in the day that ye eat thereof, ye shall be as God”. When an individual is disobedient to the word of God, he/she in essence is saying I am God and I will do as I choose. The same is when an individual takes the life of an innocent individual whether it be the life of another or themselves. The article from Reuters reveals an influx of young people that are taking their own lives through the acts of suicide. The doctrine of Satan has saturated their minds with the hopelessness of their own situation to the extent that one sees no avenue of escape from this anit-God, demonic thinking. So sad. We have all heard the old adage ‘if you want to dance, you gotta pay the piper’. In most situations, this may be true, but not when one is dancing with demons; they bring their own music and freely frolic in their spirit of deception. My friend if you find yourself in a seeming hopeless situation and are considering checking on out, consider the hope that is found in Jesus Christ and Him alone. Since the 1930’s, the gross deception of natural selection has come to be widely seen as the primary explanation of the process of evolution, thereby denouncing or acknowledging God as The Divine Creator. 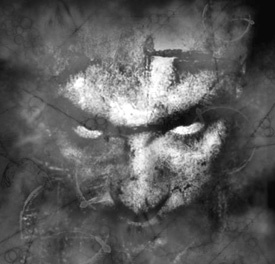 The only ones that succumb to this teaching of darkness are the fools mentioned in Psalm 14 and mighty is there deception, for they cannot answer the simple question…. I hope you enjoyed the video by VenomFangXmirror, and have considered the truth propagated, for they speak of The Creator that set His love upon us while we were yet sinners. I thank the Lord for such a young man that has firmly planted his feet upon the firm foundation of God’s word. So to answer the simple question posed above… ‘which came first the chicken or the egg?’ … let us go to the wisdom of the Divine Creator and His word.